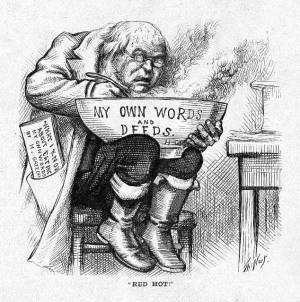 This small Nast plate shows Horace Greeley hunched over a steaming bowl of "My Own Words and Deeds," doing his best to choke them down. In his pocket is a paper entitled, "What I Know About Eating My Own Words." Although there is no direct proof, it is probable that the cartoonist availed himself of the extensive file of Greeley's past editorials and statements which was compiled and distributed by the Republican Congressional Campaign Committee. Organized by Senator Zachariah Chandler and committee secretary James Edwards, up to 300 staff members and $30,000 were given the task of searching through 30 years of Greeley materials to find the former editor's misstatements and self-contradictions. The Chandler-Edwards task force adopted the technique of the modern press agent, publishing a monthly magazine and a pamphlet called "The Greeley Record," as well as distributing a "clip sheet" of damning information to newspapers across the country. Nast's cartoon humorously expresses the difficulty that the editor's erratic record and sometimes contradictory utterances created for his presidential campaign.